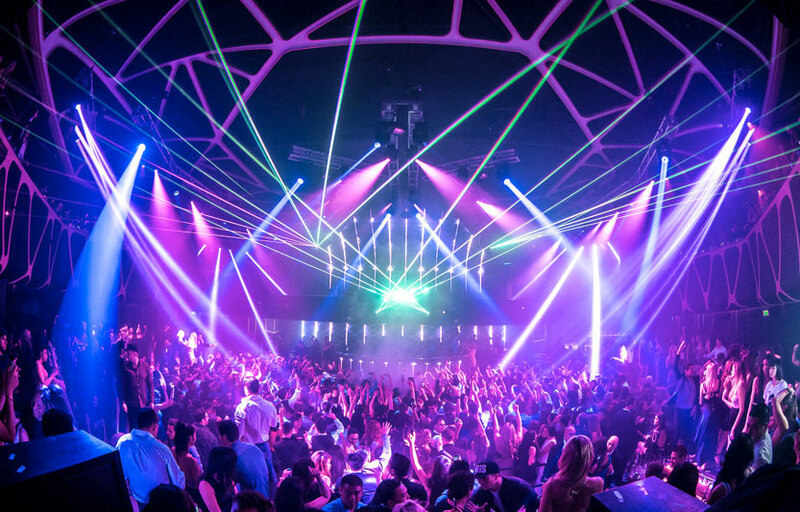 Hakkasan is Las Vegas nightlife’s crown jewel. Located in the MGM grand, Hakkasan features 80,000 square feet and five levels of dance floors, lounges, and restaurants. The first two levels feature the main restaurant, serving masterful Cantonese cuisine from Chef Ho Chee Boon. The third floor is comprised of the Ling Ling Lounge and the Ling Ling Room — over 10,000 square feet of dance floor and lounge. Ling Ling room DJs play hip-hop music; the main room is almost always electronic/house music. The top two floors are the main nightclub and upper balconies, where the resident DJs Tiesto and Calvin Harris spin regularly. The dance floor is surrounded by numerous VIP tables arranged in a semicircle facing the DJ booth, giving every table a great view of the DJ. 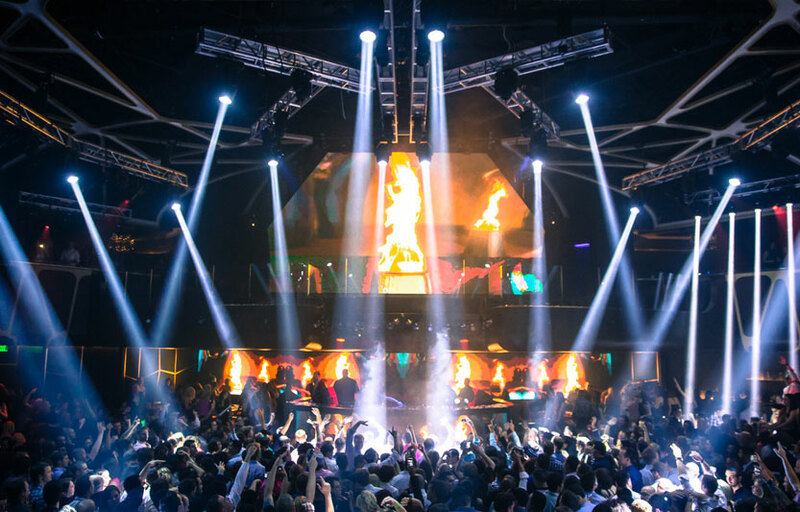 With its giant LED screens, intense light shows, and world-class performers, Hakkasan is one of the most luxurious and exclusive clubs in Las Vegas. If you’re trying to ball out on a budget, table minimums in the Ling Ling room are generally significantly cheaper than those in the Main room. The DJ in the Ling Ling room plays hip hop / top 40, and you have have full access to the main room. On nights where top tier talent (Tiesto/Calvin Harris) is playing, we’d recommend you get there as early as 9:30 to avoid the lines, as it gets insanely packed. Hakkasan is in the back of the MGM Grand. After entering the hotel, walk through the casino and look for signs pointing to Hakkasan. You can tell your cab driver that you are going to Hakkasan at the MGM grand and they will drop you off at the back entrance. How much is cover charge at Hakkasan? General admission at the door is around $30 – $50 – Expect more on holidays and special events. How long will I have to wait at Hakkasan? 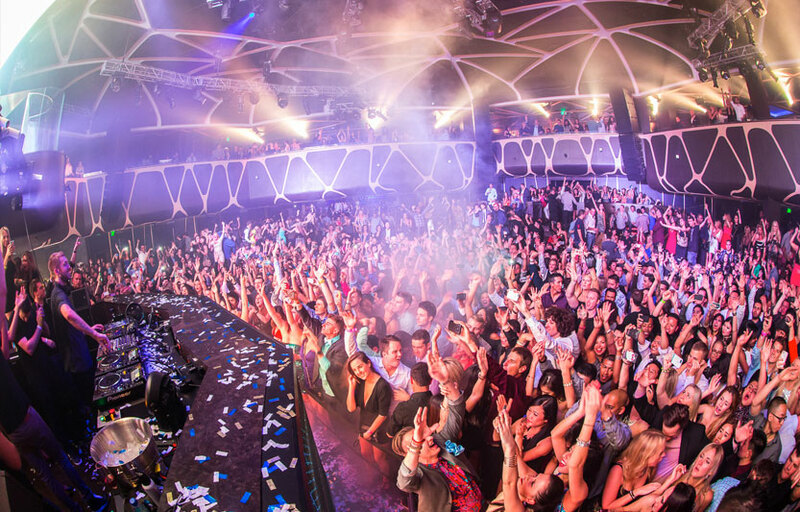 Average wait times for Hakkasan at the door are around 1-2 hours on Fridays and Saturdays. Thursdays and Sundays are typically better but there will usually be a line, depending on talent. If a top tier DJ like Tiesto or Calvin Harris is spinning, expect to wait a long time regardless of what day it is. If you’re trying to avoid long lines, we would recommend you arrive before 10 PM. Hakkasan is open from 10 til 4 AM on Thursdays, Fridays, Saturdays, and Sundays. What are the best nights to go to Hakkasan? 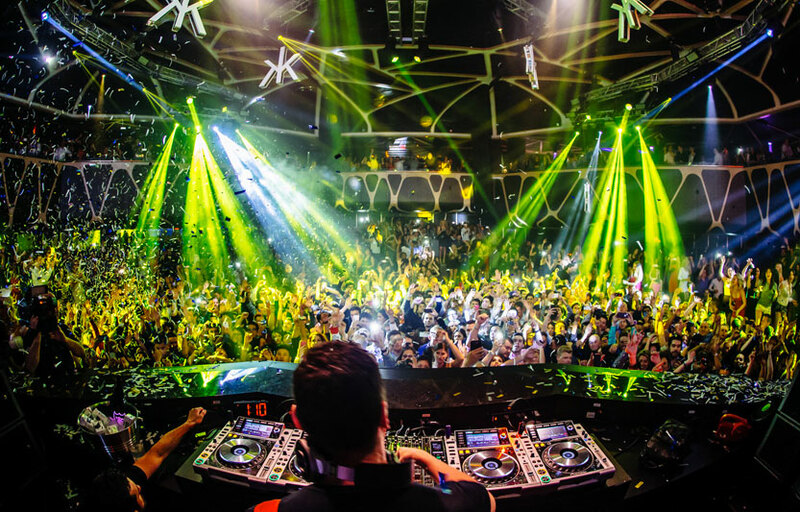 As one of the top clubs with the best DJ talent, Hakkasan is generally busy every night. On nights with top tier talent (Tiesto, Calvin Harris) Hakkasan is typically sold out and extremely packed. If you aren’t getting bottle service and don’t absolutely need to see the DJ we would recommend heading elsewhere. What is the dress code at Hakkasan? Unless you’re getting bottle service, dress to impress. Collared shirt / jeans / dress shoes for guys. Avoid anything that can be considered sportswear (track jackets, jerseys, sneakers, hats, etc). If you are getting bottle service you will have some more leeway. But better to play it safe – no bigger buzzkill than getting turned down at the door. How much do drinks cost at Hakkasan? Mixed drinks / cocktails start at $17, beers at $8, shots at $10. Resident DJs include Calvin Harris, Tiesto, Steve Aoki, Zedd, Illenium, Lil Jon and more. What type of music do they play at Hakkasan? 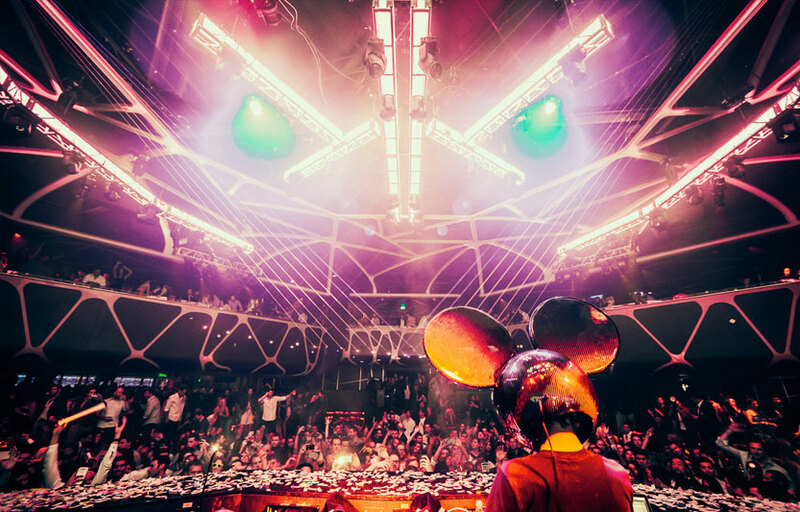 Primarily mainstream, big room house – each DJ has their own style. However there is a second room (Ling Ling Room) that plays hip hop music. Where can I find an list of upcoming events / DJs at Hakkasan? You can download the Discotech app to see upcoming events, get on guestlists, book tables, and buy tickets for Daylight. You can also visit Hakkasan’s website. In which hotel is Hakkasan located? Hakkasan is located in MGM Grand. Looking for VIP offers and comps at MGM Grand? Check out URComped.com to find a Casino Host at MGM Grand. Discotech is a mobile nightlife app and is not affiliated or employed by Hakkasan Nightclub, which is owned by Hakkasan Group. This site is for informational purposes only.